The artwork (Xerox style) is donated by David Gooday, original member of Nitzer Ebb, to raise money towards cancer research. This specific piece was created as the original art cover idea for Join in the Chant. This is a ten days auction, so don’t miss out. Stefan is auctioning off one of Nitzer Ebb’s early show flyer. This artwork is donated by David Gooday – original member of Nitzer Ebb – to raise money towards cancer research. This specific piece was created as a flyer for one of the bands first shows in Chelmsford, UK in the early 1980’s. The cancer research fundraiser is a part of Stefan Albinsson’s Livestrong fundraiser for the New York City Marathon 2011. All money raised supports this important cause. This is a short auction, so don’t miss out. From today the special page http://www.fightthecancer.nitzer-ebb.de is online to support the Livestrong Fundraiser of Stefan Albinsson NYC Marathon 2011. Get there all information about Stefans’s efforts to support Livestrong. Furthermore you can watch the original I Give To You Video. The Metal Violin used in this video and other rare Nitzer Ebb Stuff will be auctioning off shortly with 100% of the proceeds going to support the Cancer research! Keep an eye on the new page! The Nitzer Ebb Network is happy to announced that the russian website nitzer-ebb.ru will intensifying the NEP web presence as of today. 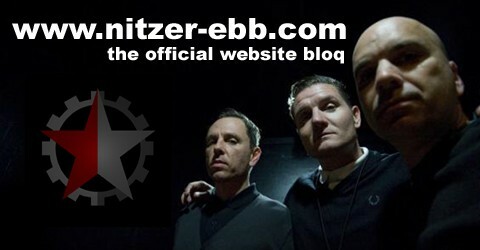 The russian website is containing the whole nitzer-ebb dot com content in russian language. Please feel free to have a look on the russian part of NE web presence! Both girls from russia, Elvira and Nina, have done a good job to keep the Ebb in russian Hearts & Minds! Many Thanks to Elvira and Nina!